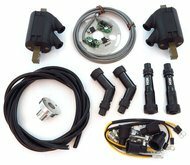 Ultima products offers the finest electronic ignition system, packaged with the finest coil, at a very competitive price. These systems feature an industry standard electronic module with programmed curves suitable for all engines up to our monster 140 C.I. 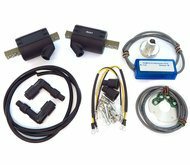 Crane Cams XR700 For Lucas helps to convert your points-type distributor to an electronic ignition with these Crane XR700 ignition modules. They offer increased timing accuracy and replace many Bosch, Lucas, Hitachi, and ND units. They feature an all-new status LED light for easy diagnostics and are fully potted for protection from dirt, moisture, and vibration. They're also highly reliable and precise, with their optical trigger design, and have a more powerful signal than points-type distributors. 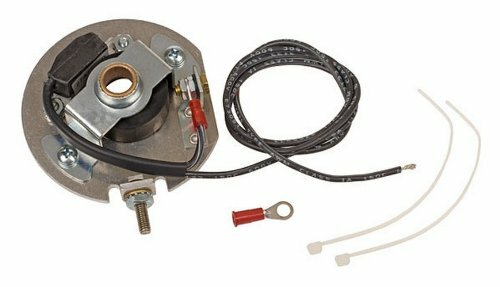 The Pamco electronic ignition comes with an aluminum rotor that bolts directly to the cam, no more mechanical advancer! There is a fully electronic (MCU) electronic advance (blue box) that should be installed under the seat away from the engine and the coils. The ignition taps into the stock wiring harness very easily. You must connect your own terminals to the wires coming from the ignition. 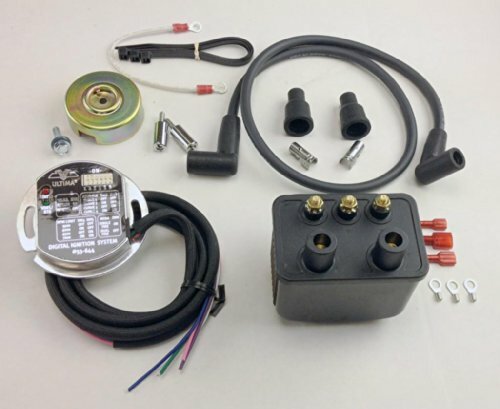 This electronic ignition uses hall effect sensor technology. Comes with ignition trigger plate, aluminum rotor, eletronic advance, and a 1 year warranty from PAMCO. Sensors are individually adjustable for exact matched timing for both cylinders. Install an electronic ignition to eliminate the entire points and condensers assembly. This electronic ignition comes with an aluminum rotor that replaces the stock rotor on the spark advancer. The stock spark advancer is still used, just the rotor is replaced. The ignition taps into the stock wiring harness very easily. You must connect your own terminals to the wires coming from the ignition. It receives power from the rear brake switch black lead or you can tap into another switched power source. 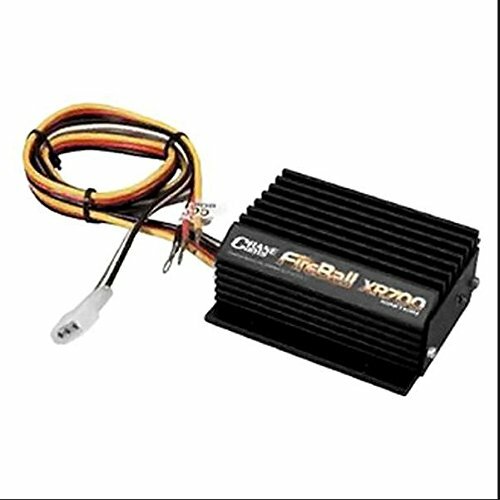 This electronic ignition uses hall effect sensor technology. 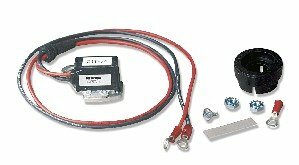 NEW ELECTRONIC TRANSISTORIZED IGNITION MODULE NOVA Used By Kawasaki and Other OEM's Easy to install compact design For most 2 and 4-cycle engine applications, such as brush cutters, chain saws, trimmers, garden tillers, snowthrowers and lawnmowers. Easy start fires well at low rpm's, NOT for use in battery ignition applications. Replaces points and condenser. Single cylinder. Universal application. 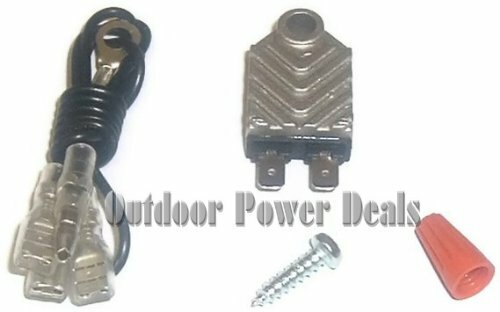 Does NOT work with most Stihl trimmers and chain saws. A solid-state electronic system "never change points again!" Test results show the Ignitor delivers twice the voltage to the spark plugs, increasing horsepower, fuel economy and plug life. System is designed for use with most point-type coils, optimal performance achieved when used with our Flame-Thrower 40,000 volt coil. Rotating cobalt magnets, mounted on the distributor shaft, trigger an electronic switching module (Hall effect integrated circuit). No points to burn, pit and corrode. No moving and rubbing parts to wear out. Electronics are molded in epoxy, eliminating deterioration from dirt, oil, grease or moisture (better foul weather performance). Fits entirely inside the distributor, no "black box" to clutter your engine compartment. Stable timing,never a need for any adjustments. No complicated wiring makes installations easy. Compatible with 12-volt negative ground systems (some applications available for 6-V negative ground and 6 and 12-V positive ground systems) Works great in stock point-type distributors as a trigger for multi spark CD ignitions, eliminating the need for expensive aftermarket distributors. California Resources Board E.O. #D-57-2, legal in all 50 states and Canada. The XR-700 Points Replacement System is designed as an affordable and better performing alternative to many factory points/electronic module systems such as those from Hitachi, Nippondenso, Bosch, Lucas and others. The system starts with the reliable FAST optical trigger that bolts in place of the breaker points in the distributor. From there, it triggers the XR-700 Ignition Module. 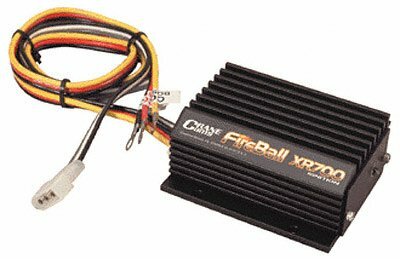 This compact inductive ignition module is compatible with 12-volt systems and even accepts positive ground systems. It improves the spark output and delivers up to 400 primary volts with about 60mJ of spark energy so your engine will rev quicker and pull through the straights like never before. Made in the U.S.A. Copyright © Wholesalion.com 2019 - The Best Prices On Electronic Ignition Kits Online.